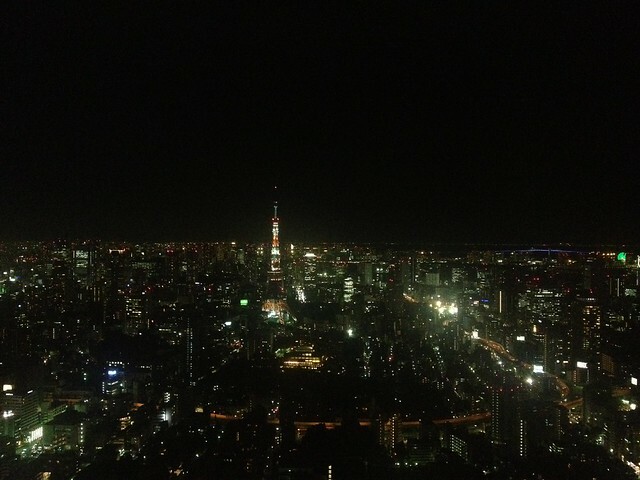 rjbs's rubric: I went to Tokyo! I said I'd give a talk on the state of things in Perl 5, which I'd done at YAPC::NA and OSCON, and which had gone well. It seemed like the topic to cover, given that I was presumably being invited over in large part due to my current work as pumpking. I only realized at the last minute that I was giving the talk as a keynote to a plenary session. This is probably good. If I'd known further in advance, I might have been tempted to do more editing, which would likely have been a mistake. Closer to the conference, I was asked whether I could pick up an empty slot and do something, and of course I agreed. I had some pipe dreams of making a new talk on the spot, but cooler heads prevailed and I did a long-shelved talk about Dist::Zilla. Both talks went acceptably, although I was unhappy with the Dist::Zilla talk. I think there's probably a reason I shelved it. If I do talk about Dist::Zilla again, I'll write new material. The keynote went very well, although it wasn't quite a full house. I wasn't opposite any speaker, sure, but I was competing with the iPhone 5s/5c launch. Ah, well! I got laughs and questions, both of which were not guaranteed. I also think I got played off about ten minutes early, so I rushed through the end when I didn't need to. This wouldn't have happened, if I'd stuck to my usual practices. Normally when I give a talk, I put my iPhone on the podium with a clock or timer on it, and I time myself. I had been using an iOS app called Night Stand for this, the last few years, but I couldn't, on Friday. I had, for no very good reason, decided to upgrade my iPhone and iPad to iOS 7 on the morning before the conference. Despite briefly bricking both devices, I only encountered one real problem: Night Stand was no longer installing. After my keynote, I went and installed a replacement app, and chastised myself for not sticking to my usual routine. By the time I was giving that keynote, I'd been in town for four days. A lot of activity tends to follow YAPCs, so it would've been nice to stick around afterward instead, but I was concerned about getting my body at least somewhat onto Tokyo time beforehand. Showing up to give a presentation half dead didn't seem like a good plan. The trip wasn't great. I left home around 5:30 in the morning and headed to the bus stop. Even though it was going to be 80°F most of my time in Tokyo, it was only 40°F that morning, and I traveled in long pants. I agonized over this, and had thought about wearing sweat pants over shorts, or changing once I got to the airport. I decided this was ridiculous, though. It turned out, later, that I was wrong. I flew out of Newark, which was just the way it always is. I avoided eating anything much because prices there are insane, but when my flight was delayed for three hours, I broke down and had a slice of pizza and an orangina. I also used the time to complete my "learn a new game each week" goal by learning backgammon. I killed a lot of time over the next few days with that app. It didn't take long to get bored of my AI opponent, but I haven't yet played against a human being. The flight was pretty lousy. I'd been unable to get an aisle seat, so I wasn't able to get up and move around as much as I wanted. Worse, the plane was hot. I've always found planes to be a little too warm on the ground and a little too cool in the air. The sun was constantly baking my side of the plane, though, so it was nearly hot to the touch. I was sweating and gross, and I wished I had switched to shorts. The food was below average. I chose a bad movie to watch. When we finally landed, immigration took about an hour. I began to despair. It would 24 hours of travel by the time I reached the Pauley's, where I would stay. Was I really going to endure another awful 24 hours in just six days? My spirits were lifted once I got out of the airport. (Isn't that always the way?) 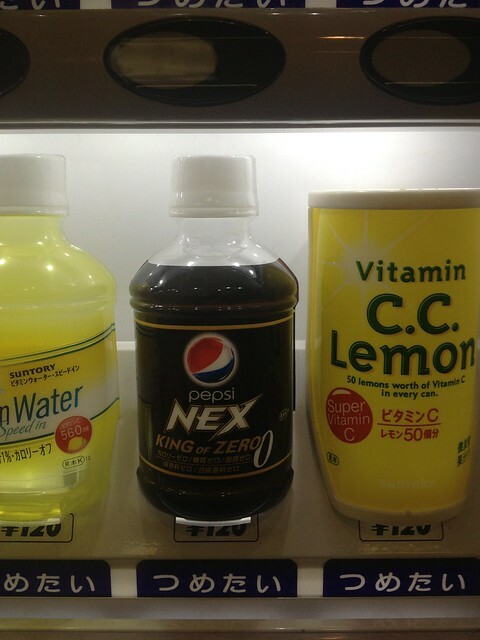 I changed my dollars to yen, bought a tiny bottle of some form of Pepsi, and went to squint at a subway map. On my previous trip, I had been utterly defeated by the map of the subway at Narita. It looks a lot like any other subway map, but at each station are two numbers, each 3-4 digits. Were they time? Station numbers? Did I need to specify these to buy a ticket? The ticketing machines, though they spoke English, were also baffling. I was lost and finally just asked the station agent for help getting to Ueno Station. This time, I felt like an old hand. I had forgotten all about the sign, but its meaning was immediately clear. They were prices for travel to each station, in yen, for each of the two lines that serviced the route. I fed ¥1200 into a ticket machine, bought a ticket, and got on the Keisei line toward Ueno. I probably could've done it with the machine's Japanese interface! I felt like a champ. Later, of course, I'd realize that the Keisei line takes a lot longer than the Skyliner, so maybe it wasn't the best choice… but I still felt good. Also, that long ride gave me time to finally finish reading It Can't Happen Here. Good riddance to that book! My sense of accomplishment continued as I remembered the way to Marty and Karen's place. When I got in, I called home and confirmed that I was alive. I said that before we did anything else, I needed a shower. Then we chatted about this and that for a few hours and I decided that I didn't need to eat, just sleep. When I woke up, the sun was already up! It was a great victory over jet lag! Then I realized that it was 5:30 a.m., and the sun just gets up quite early in Tokyo. Land of the rising sun, indeed! I got some work done and called home again. (Every time I travel, FaceTime grows more excellent!) Eventually, Karen and I headed out to check out the things I'd put onto my "check out while in Tokyo" list. 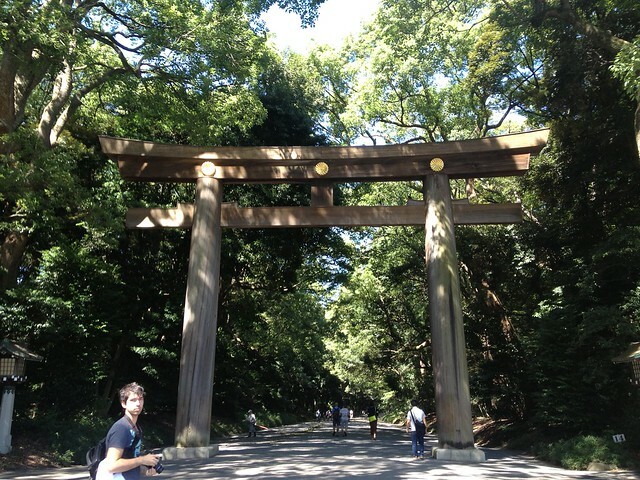 First up, the Meiji Shrine! We went to shops, did some wandering, and did not eat at Joël Robuchon's place in Rippongi. (Drat!) We got soba and retired for the night. The next day, we met up with Shawn Moore for more adventures. We went to Yoyogi Park, got izakaya with Keith Bawden, Daisuke Maki, et al., and Shawn and I ended our night with our Japanese Perl Monger hosts. 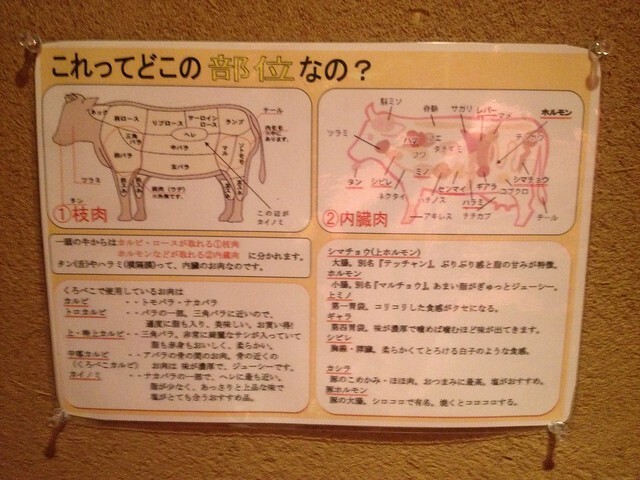 We had a variety of izakaya food, but nothing compared, for me, to a plate of sauteed cabbage and anchovy. I could've eaten that all night. I also learned, I think, that I don't like uni. Good to know! Before leaving Minami-Senju, though, we got curry. Shawn had been very excited for CoCo Curry on our 2011 trip, and I was excited for it this time. Their curry comes in ten levels of hotness. I'd gotten level five, last time, and this time got six. In theory, you have to provide proof that you've had level five before (and, you know, lived) in order to get level six. I didn't have my proof, though, and I thought I might need Shawn to badger the waitress for me. Nope! I got served without being carded. I had found level five to be fairly bland, and so I expected six to be just a bit spicy. It was hot! I didn't get a photo! I really enjoyed it, and would definitely order it regularly if it we had a CoCo Curry place in Pennsylvania. If I go back to Tokyo, I will eat level seven CoCo Curry. This is my promise to you, future YAPC::Asia organizer. Yes, you may watch to see if I cry. After some more slide wrangling, we crashed and, the next morning, were off to the conference. YAPC::Asia is a strange conference for me. On both of my trips there, I've been an invited speaker, and felt very welcome… but feeling welcome isn't the same as feeling like a part of things. The language barrier is very difficult to get past. It's frustrating, because you find yourself in a room full of brilliant, funny, interesting people, but you can't quite participate. It's sort of like being a young child again. Of course, that's what happens when the room is full of Japanese-speakers listening to another Japanese-speaker. It certainly need not be the case in one-on-one conversation. I chatted with Daisuke Maki, Kenichi Ishigaki, Hiroaki Kobayashi, and some others, but it was far too few and too infrequent. It was much easier to stick to talking to the people I already knew. In retrospect, this was pretty stupid. While it's true that I don't see (say) Paul and Shawn and Karen very often, I can talk to them whenever I want, and I know what topics to ask them about and so on. This year, YAPC::Asia had eleven hundred people. So, that's something like a dozen that I knew and 1088 that I didn't. Heck, there were even a few westerners I didn't go pester, where there'd be no language issue. I wanted to try to convince more of the amazing talent in the Japanese Perl community to come hack on perl5.git, and for the most part, I did not do this outside of my in-talk exhortation. In that sense, my YAPC::Asia was a failure of my own making, and I regret my timidity. In every other aspect, the conference was an amazing success as far as I could tell. It was extremely friendly, professional, energetic, and informative. I sat through a number of talks in Japanese, and they were really interesting. People sometimes talk about how there's "CPAN" and "Darkpan" and that's that. You're either working with "the community" or you're not. The reality is that there are multiple groups. Of course "we" know that in "the" community. How much crossover is there between the Dancer community and the Perl 5 Porters? Some. Well, the Japanese Perl community — or, rather, the community in Japan that made YAPC::Asia happen — has some crossover with the community that makes YAPC::NA happen, but there are large disjunct segments, and they're solving problems differently, and it's ridiculous to imagine that we can't learn from each other. Even if it wasn't self-evident, it was evident in the presentations that were given. After attending the largest YAPC ever, by quite a lot (at 1100 people!) 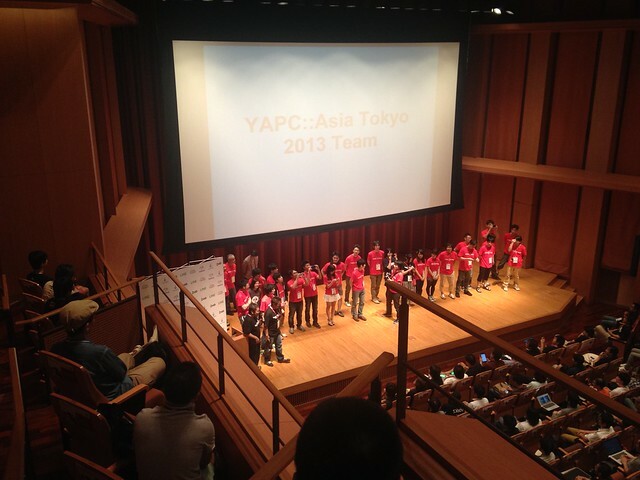 it was also sad to learn that this may be the last YAPC::Asia in Tokyo for some time. The organizers, Daisuke Maki and the enigmatic "941" have been doing it for years, and have declared that they're done with it. It seems unlikely that anyone will step in and run the conference in their stead, at least in Tokyo. There may be, they suggested, a change to regional Perl workshops: one in Sapporo, one in Osaka, and so on. Perl workshops are great, but will I make it to the Osaka Perl Workshop? Well, we'll see. If I do, though, I'm going to do my best Paul Fenwick impression and force everyone there to talk to me all the time. When the conference was over, Karen, Marty, Paul, Shawn and I headed to dinner (with Marcel, Reini, and Mirjam) and then to… karaoke! At first, Marty was reticent and not sure he'd stick around. Paul's opening number changed his mind, though, and we sang ridiculous songs for ninety minutes. I drank a Zima. A Zima! I thought this was pretty ridiculous, but Paul one-upped me, or perhaps million-upped me, by ordering a cocktail made with pig placenta. I declined to sample it. 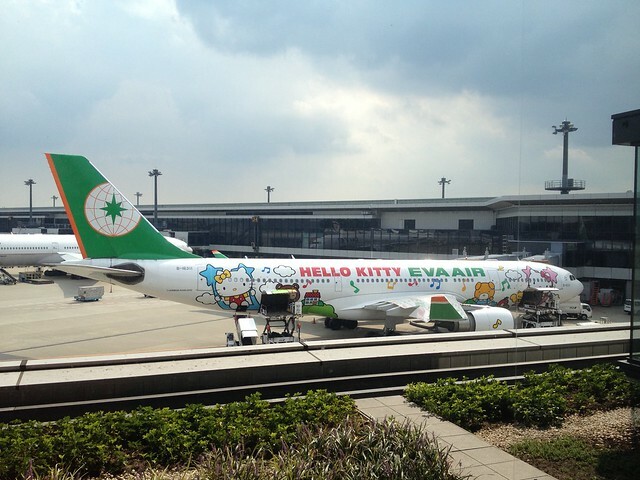 Narita was fine. Great, even! The airline staff treated me like a king. I got moved to an aisle seat with nobody beside me! I killed time in the United lounge, had a few free beers, and transferred some movies to my iPad. In short order, we were aboard and headed home. The flight was only eleven hours, customs was quick, and soon (finally!) I was reunited with my family and off to Cracker Barrel for a "welcome back to America" dinner. It was a great YAPC, and the most important thing I learned was the same as always: I'm there to talk to the people, not listen to the talks. I'll do better next time!